BATTLE OF THE SELFIES: Travel Startup, The Flash Pack, beats Cancer Research UK’s No Make-up Selfie to win top social media award. Group travel company, The Flash Pack, has beaten Cancer Research UK’s No Make-up Selfie to win this year’s UK Social Media Communications Award for Best Viral Campaign. 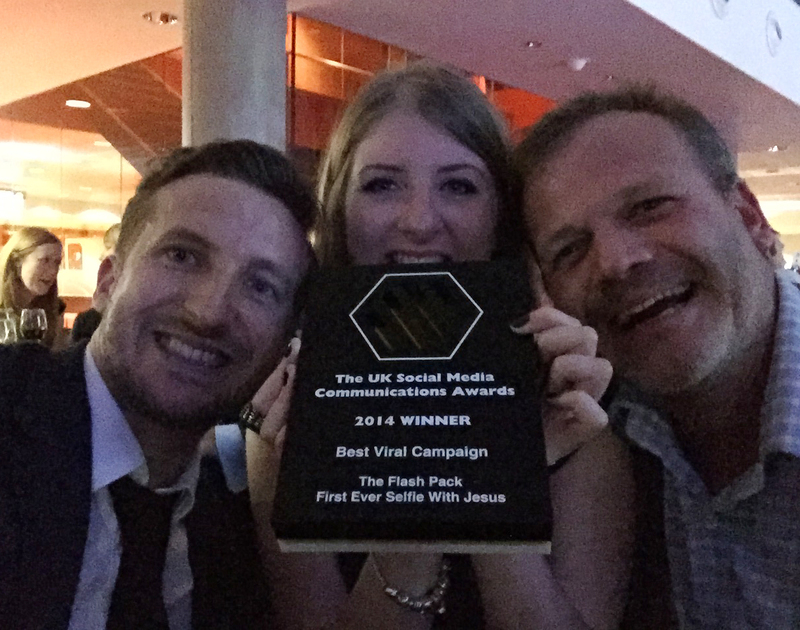 The Flash Pack scooped the award thanks to their First Ever Selfie With Jesus Campaign which the founders thought up from their back bedroom office in Brixton. The selfie, which went viral in June 2014, was the brainchild of Radha Vyas and Lee Thompson, who wanted something that would both represent The Flash Pack’s ethos and officially put the company on the map. Winning this award proves that it most certainly did that. 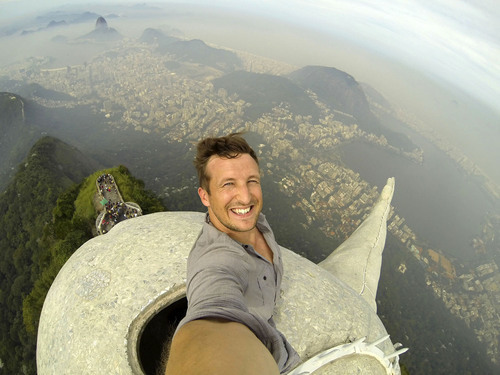 With zero budget and nothing more than a GoPro and some positivity, The Flash Pack managed to create a huge buzz around their selfie on top of Christ the Redeemer in Rio de Janeiro. So much so that it has now become a trend in itself, with numerous others making the journey to take their own selfie with Jesus. Not only that, but the company has seen huge growth since the selfie, having more than doubled its staff count and sold out on many of their flashpacking group trips. “We’ve managed to turn the ‘flashpacking’ travel trend into a successful business thanks to the Jesus selfie. The campaign has allowed us to reach customers internationally, which would have normally taken us years to achieve. We now have intrepid travellers from America, Switzerland and Belgium who are 'roughing it in luxury' on a Flash Pack trip! It just goes to show that you don’t need teams of people to make a marketing campaign work.” says Lee Thompson, co-founder of The Flash Pack who featured in the selfie. Facing tough competition from Cancer Research UK’s viral No Make-up Selfie and Buzzfeed’s Fosters #GoodCall campaign, the judges felt that what The Flash Pack achieved with no budget and a small team trumped the bigger companies. The award marks the end of The Flash Pack’s first year in business and proves that you don’t need a £1million budget to make your marketing dreams come true. Their success doesn't stop here, they are also edging closer to a win at the O2 Smarta Awards for Best Use of Marketing and need a few extra votes to help them win! More images are available on request. The Flash Pack launched in August 2013 and is the first travel company to cater for 30-40 something adventure seekers. They offer trips to Spain, Morocco, Iceland, Istanbul, Egypt, Vietnam, Myanmar, Brazil, Chile, and Uganda. The awards celebrate the very best in UK social media communications and reward the individuals, companies and organisations who are using online platforms to communicate in fresh and innovative ways. Now in their fifth year, the 2014 awards was held in London at The Emirates Stadium on Thursday 23 October and attracted over 300 digital and communications professionals from across the UK. This press release was distributed by ResponseSource Press Release Wire on behalf of Flash Pack in the following categories: Business & Finance, Travel, Media & Marketing, for more information visit https://pressreleasewire.responsesource.com/about.